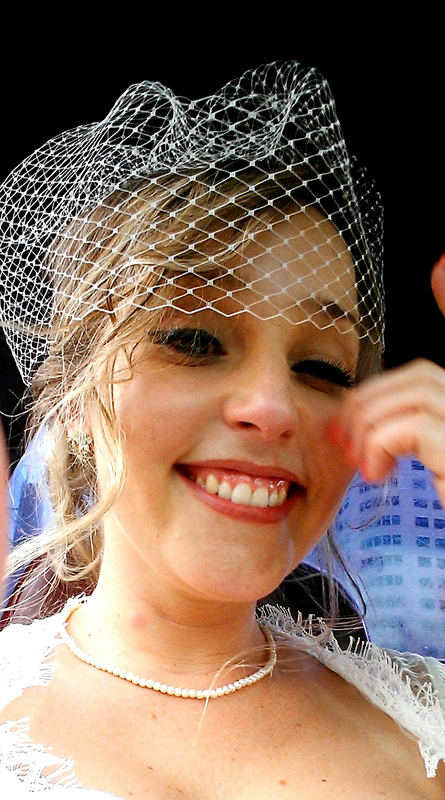 Horray!! It’s Wednesday again! (Yes I know this post is a little bit late, gimme a break) That means it’s time to trash pre-conceived ideas of how things should be done. So lets get to it! It’s just about spring cleaning time, and that means it’s time to clear the cobwebs and clutter: out with the old and in with the new. Right? 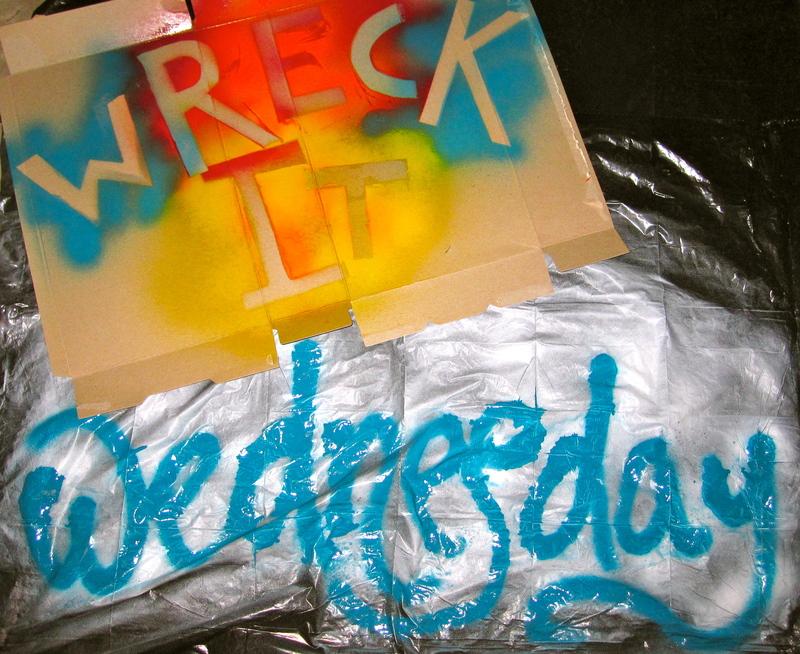 Well, If you’re anything like me, you’re not swimming in a sea of extra cash to be replacing a bunch of stuff around the house, That’s where this week’s Wreck it Wednesday comes in awfully handy. Today, we’re gonna take a fresh look at some not so fresh decor. If you’re like me, you have things hanging around that you’ve thought of tossing out the door. I say, “Nay, nay!” Wait just one hot minute. For just a few bucks, you can completely change your decor from outdated to outstanding. Between a divorce, a move and a new job in the last year, I have cleared a great deal of the riff-raff out of my home. But these three amigos for some reason have dodged my “goodwill drafts” time after time. I honestly don’t even recall how they made it into my life to begin with. I have been staring at these vases for what has easily been 2 years, plotting their fate. Today, They are finally getting the cosmetic surgery they need to fit into the society that is my tiny apartment. I suggest you take a look around your house, clear the clutter and figure out how to make what you have left into something you love. Now that we have our facelift subjects…we need to consider how these items can be transformed to feel more at home, in our home. I decided to color them happy, which can be done for a few dollars with a can of spray paint. 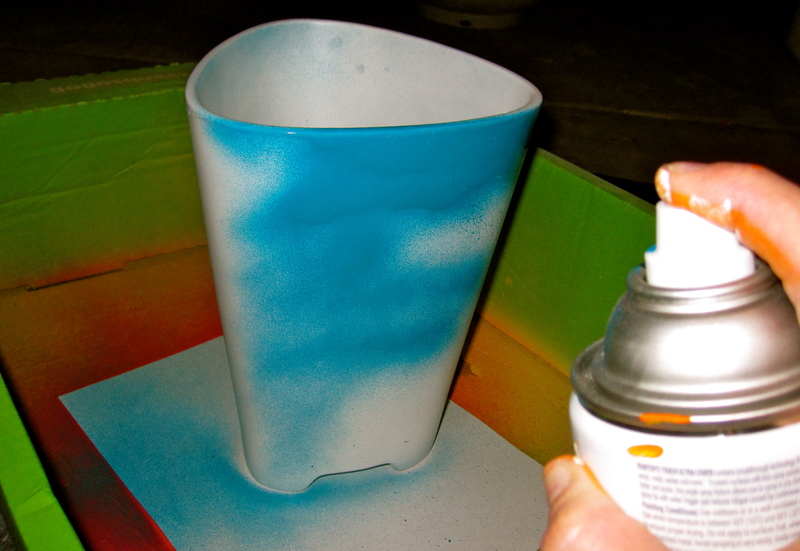 The awesome thing about spray paint, besides being inexpensive, is not only does it come in super sweet colors and finishes, but it also comes in textures. This gives a fairly substantial array of choices and options to redecorate with the things you already own. 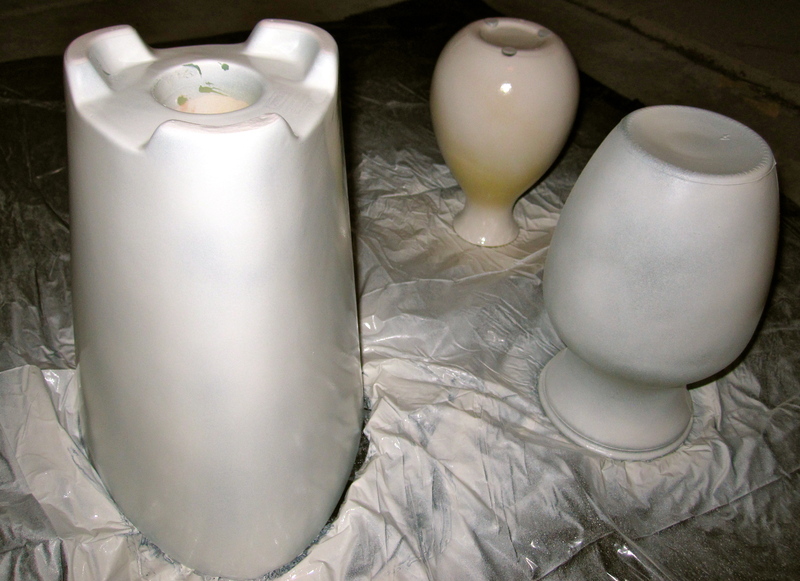 Apply an even coat of primer first. Once the primer is dry, apply paint....evenly, duh. 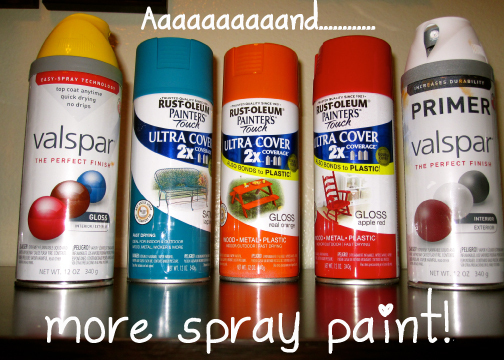 Apply a second coat, if needed. Evenly, duh. 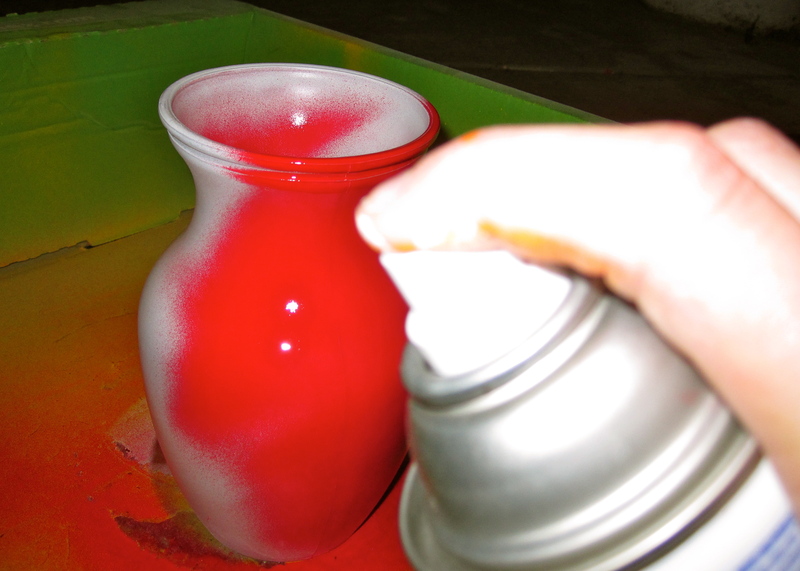 Allow to dry completely before applying a second coat...and before attempting to pick up/move the object. Yes, I could send these little gems to Misfit Island (my stash of crap I intend to garage sale…someday, in the next 50 years or so). But it’s so sad to see these treasures being unutilized or sold at rock bottom prices just because their colors don’t quite fit in anymore. Why should I get rid of them, just to go out an spend more money, duckets I don’t have, mind you, on shiny new vases? 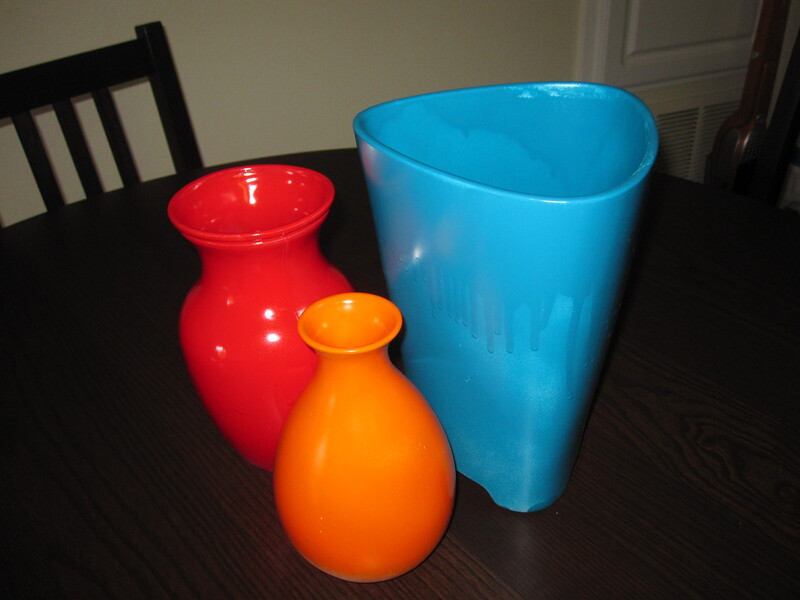 Well, here you have it: my pretty “new” vases, and it cost me less than $10. I call that a win for the bargain decorator. You’re welcome. 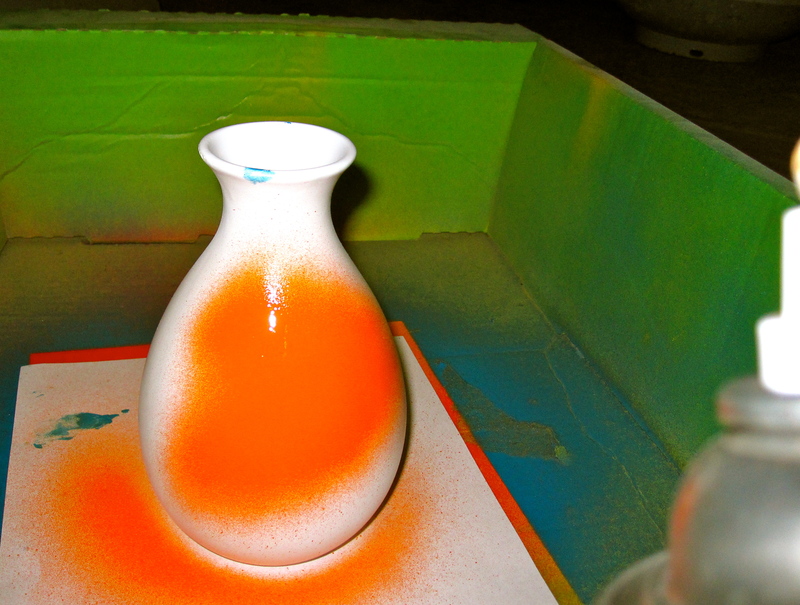 Okay, I'm sure you all are noticing my sloppy handiwork here, with the drippy paint. I will have you know that it was done on purpose. Call it art, I guess...but that's the way, uh huh, uh huh, I like it. Uh huh, uh huh. To each their own. 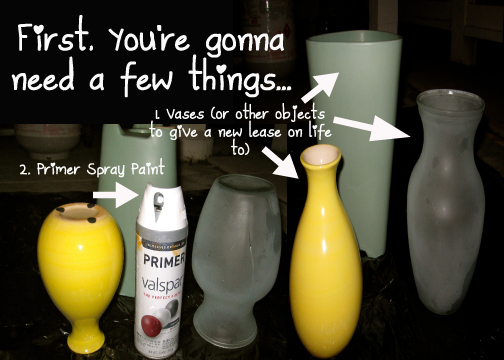 Here’s a nice little tip: if you don’t have vases, and would like to have some, you could go to Walmart and buy a case of mason jars for super cheap and do this same project. Presto change-o. Oh and if you’re sloppy with your painting like me, never fear. Nail polish remover works wonder on taking that rogue paint off your skin. I hope you all enjoyed this week’s Wreck. Next week, we talk bacon. You don’t even know. ← You gotta let me know…should I stay or should I go?